Occasionally, system advisor availability status can become out of sync, displaying a listing as being "Busy" when it's not. Should you find yourself in this situation, you can reset your status to "Available" by using the Stuck on Busy Tool. This tool is considered to be in "beta", offering only the very core of the planned functionality. If you have any problems with using it, please contact Customer Support via the customer support form. 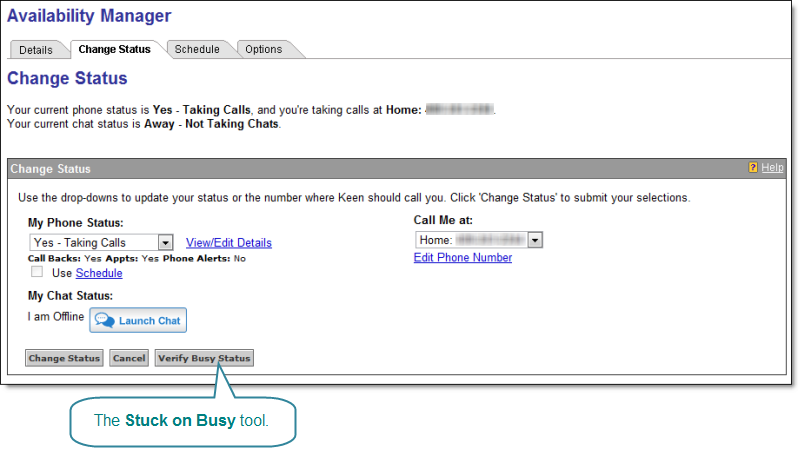 If you suspect you're stuck on busy, simply click the "Verify Busy Status" button. A yellow message area will appear at the top of the "Change Status" box. When your status is reset, the message area will again display "Your status is 'Not Busy'". Do not reset your status when you are actually on a Keen call or chat! LVS will be negatively impacted (your purchase rate for the particular listing will go down). In summary, improper use of this tool will negatively impact you, the experience your customers have when trying to reach you, and your rating points and LVS.